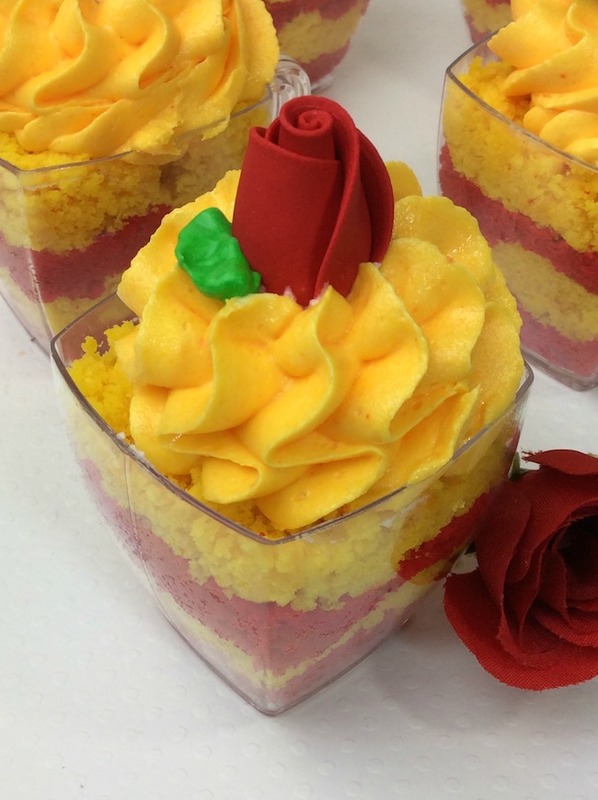 A beautiful “Belle” inspired cupcake filled with colors of red and yellow that represent Belle’s beautiful dress. 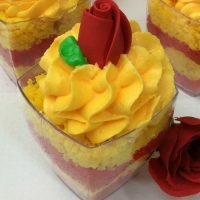 Beauty and the Beast is a classic and if you have a little girl who is a Belle wanna-be then of course a Belle themed party may be on their wish list – and this stunning cupcake dessert is sure to be a hit with the little princesses and princes that are to be in attendance. They are pretty easy to make with just a touch of patience and are sure to be a hit with the look and flavors everyone will love. 2. 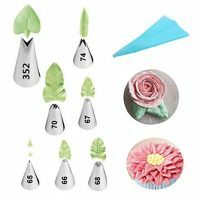 Line cupcake tins with paper liners. 3. Sift flour, baking soda, and salt all together. 4. Mix the dry ingredients with a wire whisk for 3 minutes. 5. 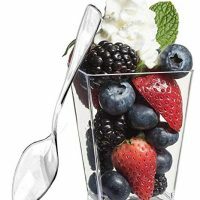 In a separate bowl using an electric mixer, beat the butter, shortening and sugar until it is light and creamy. 6. Add the egg and vanilla. 8. Add the flour mix and milk, 1/2 portion of each at a time, mix until completely combined. 9. Split the batter into two bowls. 10. Add Red Velvet extract to one batter and add yellow food coloring to the other batter. If you would like to adjust the red color that the Red Velvet Extract makes you can add some red gel food color to brighten it a bit. We added just a few drops to our batter to get a more vivid red. 12. Bake at 350 degrees for 20-22 minutes or until an inserted toothpick comes out clean. 13. Cool for 10 minutes. 14. 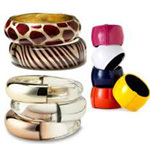 Remove from cupcake tins to a wire rack until totally cooled. 15. 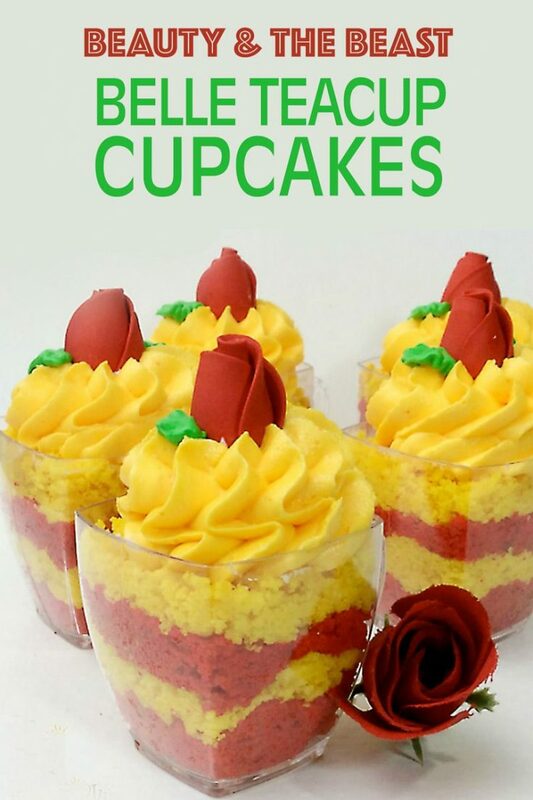 Once cooled remove paper from cupcakes, place each colored cupcake int0 separate bowls and crumble them until fine crumbs are formed. 17. 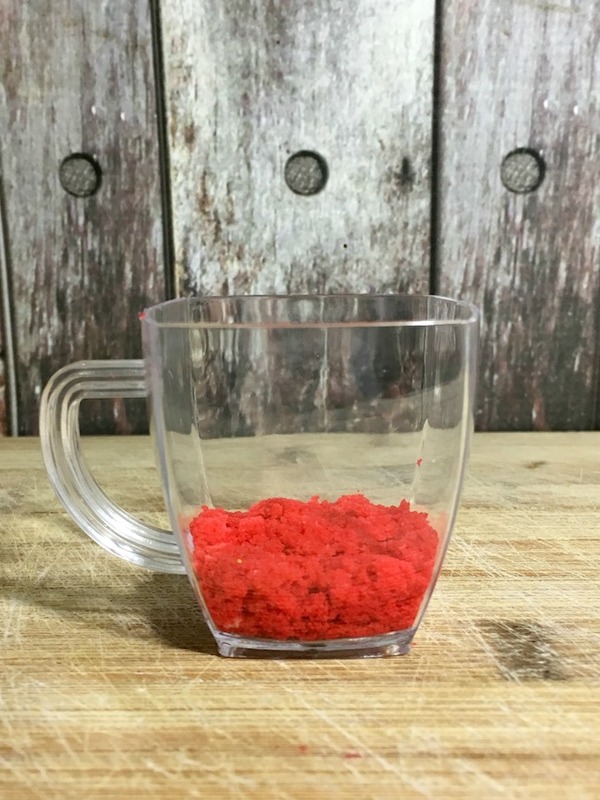 Take the your dessert cups and layer 1 tablespoon of the red cake crumbs first. 18. Then repeat with 1 tablespoon of yellow crumbs. 19. 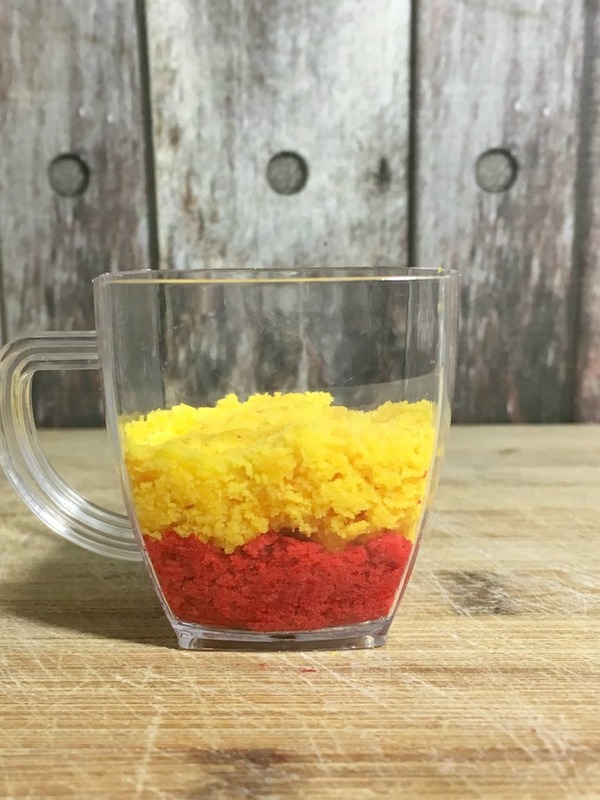 Repeat with both cake crumbs until you have two layers of red cake crumbs and two layers of yellow. 1. Sift together your sugar and salt in a large mixing bowl. The sifting will help keep your frosting from being too chunky, so we do not recommend skipping this step. 2. Add butter to the bowl and beat on low speed for a few minutes then increase to medium until the sugar and butter are thoroughly mixed. 3. Add the in all of the vanilla extract and then add the milk a tablespoon at a time and continue mixing until you have a fairly soft, but yet stiff icing. You want to make sure it is soft enough to be used in a piping bag. 4. When you are happy with the consistency, scoop out about 5 tablespoons of icing and place in a separate bowl. Leave the remaining icing in the original bowl. You will need to do this so you can create your yellow and green icing. In the original bowl where you blended all the icing ingredients add 3-4 drops of yellow food coloring and stir until well blended. Add additional drops as needed to get a bright yellow icing. Add the frosting to a large star tipped pastry bag. Pipe a little bit of frosting onto the top of each of the tea cups. Add 1-2 drops of green food coloring to the other bowl you added a few tablespoons of icing too and stir until well blended. Add more coloring as needed to get the green color you love. The red rose can be added either with an edible rose accent as I have done for my own or if you want a more custom look you can create your own with a rose pastry bag tip. Just adjust the icing recipe a bit to make a little extra and separate out some to a 3rd bowl and add red food coloring. Give your little beauty a cupcake fit for a princess! 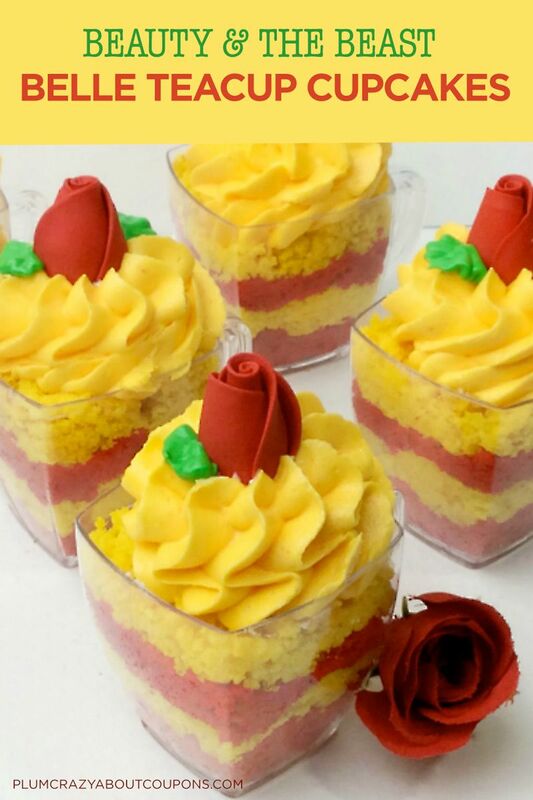 These adorable Beauty and the Beast cupcakes are as beautiful as they are delicious! ½ cup butter soft, plus 4 tbsp. Sift flour, baking soda, and salt all together. Split the batter into two. Spoon the batters into their own cupcake tins until 2/3's filled. Take the yellow cupcakes and crumble into their own bowls. Take the little tea cups and layer 1 TBSP of the red cake crumbs first. 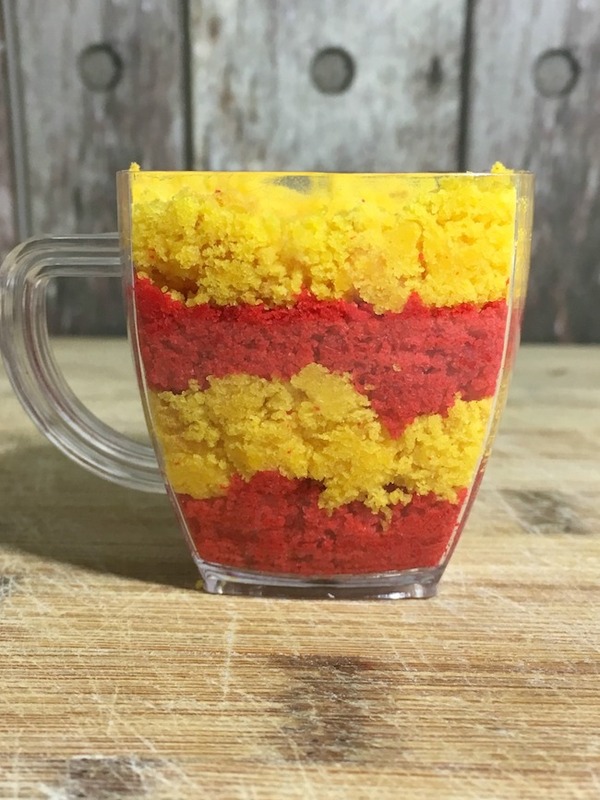 Repeat with both cake crumbs until you have two layers of red cake crumbs and two layers of yellow. Sift together your sugar and salt in a large mixing bowl. The sifting will help keep your frosting from being too chunky, so we do not recommend skipping this step. Add butter to the bowl and beat on low speed for a few minutes then increase to medium until the sugar and butter are thoroughly mixed. Add the vanilla extract and then the milk a tablespoon at a time and continue mixing until you have a fairly soft, but yet stiff icing. When you are happy with the consistency scoop out about 5 tablespoons of icing and place in a separate bowl for your green icing. Leave the remaining icing in the original bowl. In the original bowl where the rest of the icing remains add 3-4 drops of yellow food coloring and stir until well blended. Add additional drops as needed to get a bright yellow icing. Pipe a little bit of frosting onto the top of the tea cups. Add 1-2 drops of green food coloring to the 5 or so tablespoons of icing you have separate out and stir until well blended. Add more coloring as needed to get the green color you love. 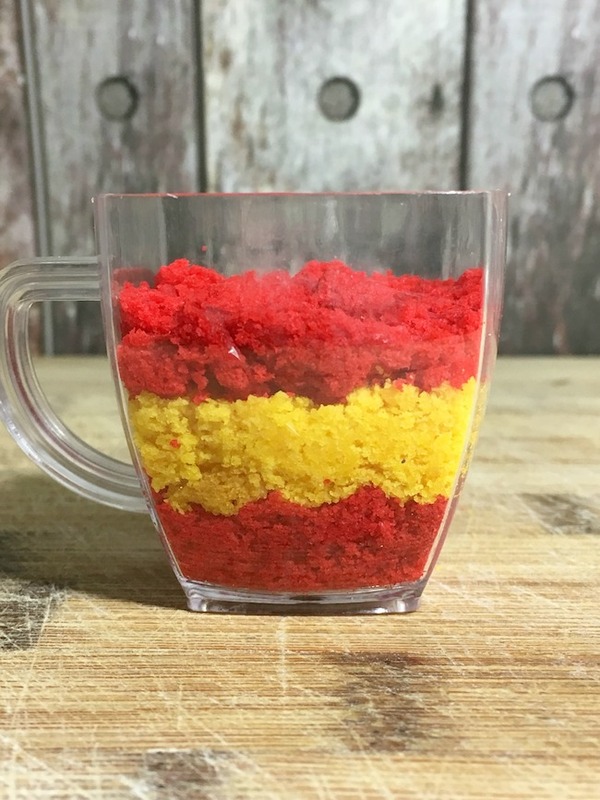 When adding the red velvet extract to your batter it will begin to turn a red color. You can add additional red food coloring to adjust the color to your liking. How many does the recipe yield? Also where do I use the red velvet extract? Hi Leetia! Sorry about that – we will get this updated asap. But this recipe should yield 24 cupcakes and the extract should Red Velvet extract should be add to one of the batters after you split them. This will give the batter the flavor and color.